This is simply the best sounding set of speakers ever. I thought the sound from just plugging in the iPod directly on top of the "boom box" case was pretty awesome, but the Airport Express, optical cable and Apple iPod HiFi makes quite (!) a combination that would be pretty hard to beat. Thanks to Larry for the tip-off with the optical cable... good spot! I searched the net looking for some digital media to help my students understand and appreciate the effect of forces on objects. I had already tried the obvious places, YouTube, Google Video etc.. and drew blanks. 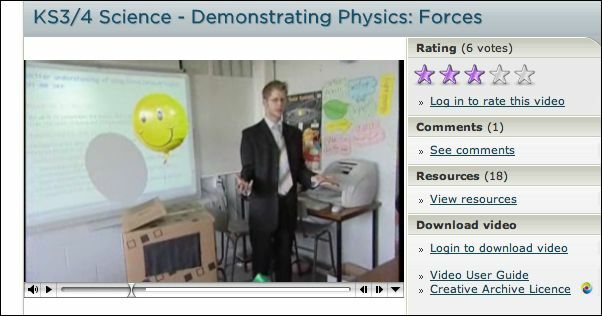 I searched the Teachers TV programmes, and hit upon this video, KS3/4 Science - Demonstrating Physics: Forces featuring David Richardson from the Institute of Physics. As a teacher, it was a truly inspiring programme to watch a demonstration of a scientific theory which began with the awe and wonder that interests and engages students so brilliantly - it certainly captivated me. So many ideas can be gleaned from watching other professionals. The programme featured a scientist giving a demonstration to teachers during an INSET session, and later, the teacher repeating the same principle in front of their class of students. It was a really helpful to note the scientists explanations and then to see the students reactions and comments - it was almost as though you had already had a 'dry-run' of the activity. Wonderful. Naturally, I couldn't help but want to present the same principle to my students and indeed the awe and wonder and instant engagement was there. Goodness, us Mac users have it easy... it's a question of usability surely? Just been reading a really interesting article contrasting the user experience of the Apple Mac OS and Microsoft Vista. Although the author of the article seems to have a heavy bias towards the Mac OS - John seems to summarise my experience of the Windows platform very well. To put it simply, you can work on a Mac for hours, days even, and only minimally need to directly use the OS. With Vista? The OS demands your attention, constantly. Vista reeks of committee and design by massive consensus, while OS X shines from an intense focus on doing things in a simple, clear fashion and design for the user, not the programmer. Sums it up pretty well I thought. Google Job-bot... is there no end to Google's take over of the world? I've been following Tom Smith's article about Google over the past two days. Tom's blog entry today, More on Google's State of Mind is particularly poignant and talks about Google's software making judgements about blog sites and how kosher they are at being a genuine Adsense site. I read this evening that Google is deploying a robot to scan job applications from prospective employees searching for a job at Google. How long before that algorithm becomes common place? I hope, never. If you have an amusing experience of Google's recruitment practices - successful or otherwise - share it with us here. We'll set our own robot on the replies, and pick out the ones whose opinions most closely resemble our own. 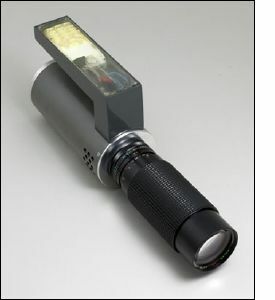 A handheld SMS message projector - eDemocracy idea anyone? 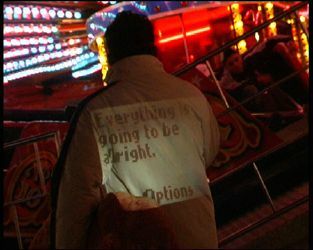 Read more about the Guerilla Projector. Despite it looking like something out of Star Trek or Dr. Who, I love the concept of people contributing to a screen in a public space and SMS technology just seems a natural way of doing it. In terms of eDemocracy, this would be a really handy tool. Imagine posing a question or a statement for the public to respond to, and have their contributions displayed in a public arena. Brave politicians might try it for instance, or local governments inviting for public opinion about topical issues relating to their town or county. This would be a fantastic way of engaging the public in a consultation process. "Where are we all going?" 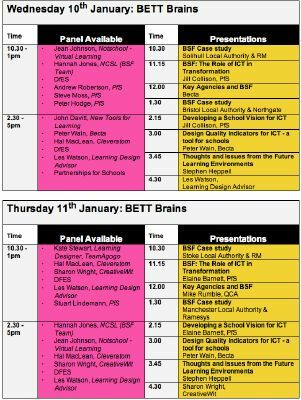 "Everything is going to be alright"
BETT, the Educational Technology Show takes place at between 11th and 14th January 2007. The show attracts some 28,000 visitors bringing together the global teaching and learning community. It really is the place to be. The show usually features a good mix between experienced exhibitors and presenters in the field of educational technology. The feature stand this year is "Tomorrow's Learners Today" and is supported by DfES and Partnership for Schools amongst others. When technology can do anything we wish, says Professor Stephen Heppell, the question becomes: What should we wish for? The stand is divided into two. One half will showcase a school each day. Pupils on the stand will be surveying visitors and exhibitors about their ideas on future schooling. At the end of each day, the results from the surveys will be announced. 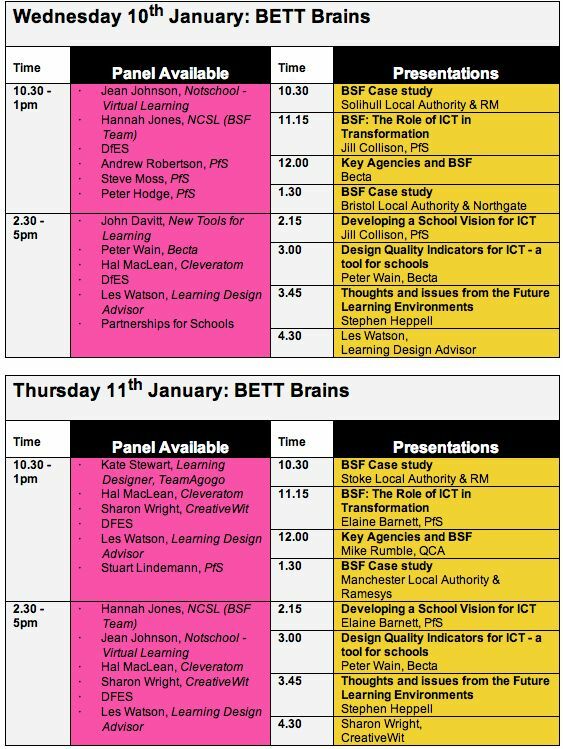 ... along with several representative from Partnership for Schools (PfS) and not forgetting Stephen Heppell presenting daily. 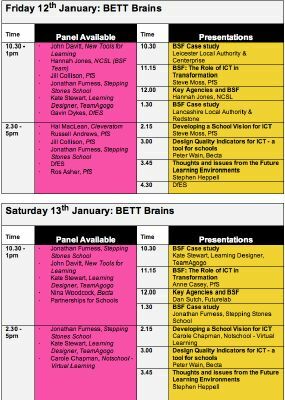 I will also be on the stand talking about my work with Stepping Stones School on Friday and Saturday, so please do come along and meet me on the stand, D62. You can read more about the feature stand. I've re-alivened my interest in Webnote - an online tool for writing notes within a web browser. It's a great little tool for capturing thoughts and ideas and crucially, sharing those with collaborators. Several years ago, I used Webnote for giving presentations to an audience on Ultraversity. I love the tactile nature of the notes, picking them up and moving them as I move through the presentation. Few people know that you can format the text inside the notes with HTML code, which means you can also add images and tables. I've tried adding QuickTime movies and sound with mixed results. Sadly you can't control the movies that play because that interferes with the way in which the sticky notes work. Maybe something Tony could work on, although I recognise this is a project that was created many years ago now. Last week I installed Webnote on the Learning Spaces server so that others could play and explore it's features. Once webnotes are saved, you can access the webnotes from anywhere using the URL of the webnotes page. One of the drawbacks is that there isn't a permissions model to grant or deny access to individual users or groups of users. 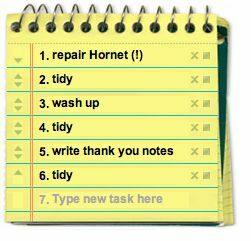 However, I just love the simplicity of the tool and its adaptability towards many purposes from note taking to presentation and webpage creation, not forgetting how easy it is to share what has been created with others. I've been looking for something like this for years and it's very nearly perfect. Essentially, this is a tool for building a custom webpage with personalised content, widgets and gadgets. It is powered by, unsurprisingly, Google and uses your Google Account to store and configure your personal homepage. There are many widgets and gadgets to choose from, from boring but essential items like calendars, todo lists, tv guides, currency converters to more interesting ones such as RSS News feeds from sites of your choice and list of recent emails. You can create your own Google Gadgets too, which is just as well, since no matter how hard I look, I can't find a gadget that allows me to just write and save hyperlinkable URLs to the page - huh? This is basic HTML, but of course I want a simple WYSIWYG editor. Apple have been developing Dashboard which is built into Mac OS X and is a similar sort of feature with widgets that do cool and useful stuff for users. What I just don't get, is why would I disappear off to another (hidden) part of the operating system to perform certain functions? I've long since wanted tools such as the ones talked of above, to be available from the desktop of my computer, but on reflection, that's a bit limiting. Access through a web browser just seems more natural and makes me wonder how soon it will be before the desktop becomes the web browser. Can't be that far off. One of the significant advantages of Google's Personalised Homepage, is that I can access the tools and features that I selected from any browser on any system. In response to lots of interest in the Ford Engine screensaver, I have placed the Flash version on this site. 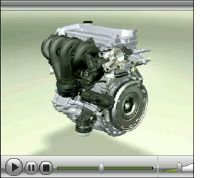 Download (11.2MB) - (ctrl click to save file to desktop) The animation shows a 3D DOHC 4 cylinder engine being constructed from a bare casting and shows the various components being bolted onto the engine block. When the assembly is complete, the engine begins to run, showing an individual cylinder running through all 4 strokes. 3rd Billericay Scouts recently completed the Mechanics badge, where we used this animation to teach our youngsters about how an engine works and the components found inside. The only reason for making the Ford Engine screensaver available here, is that it doesn't seem to exist any more at the original site. Please keep this service running. Due to the enormous interest in downloading this screensaver from this site and the large amount of traffic coming to my server host, I would really appreciate a donation towards the hosting costs of this service. Many thanks for your understanding. Just upload to your .3gp capable phone and play it! Please support this screensaver development. There is another animated construction of an engine, this time a diesel engine made by Perkins which can be downloaded from this website. Download the Perkins 3D diesel engine animation. Friend, Jonathan Briggs, interviewed Tom Smith about Burning a Hole and elicited some of Tom's ideas behind his latest project, his intentions and indicators of success. Listen to the Podcast. Also, are you still Christmas shopping? Looking for gift ideas and inspiration? ...then visit the Burning a Hole site. 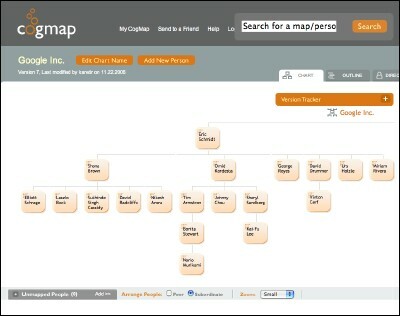 This is a tool for generating organisation charts using AJAX technology. Currently, CogMap has a very basic set of features, i.e. 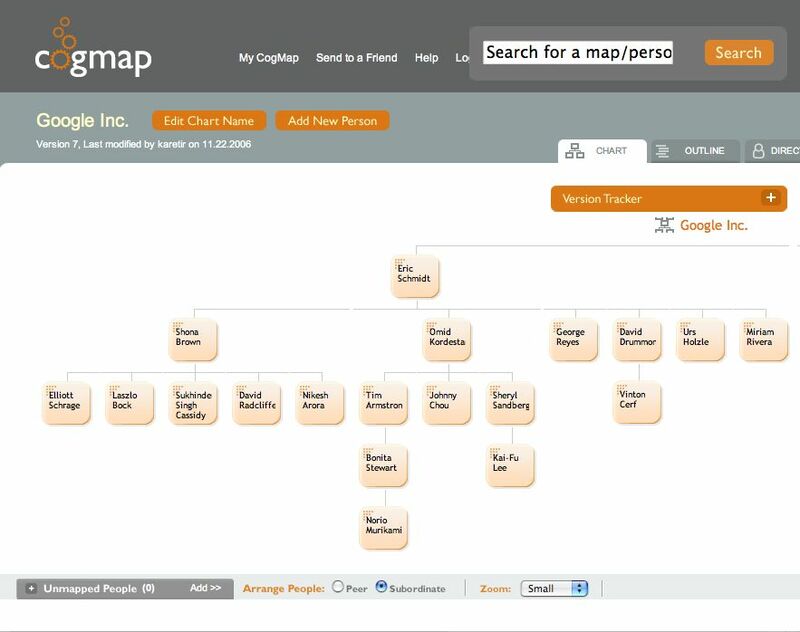 there is no permissions model and you can't generate more complex organisation charts. However it makes a nice change to use a simple set of tools without all the complexities associated with users and groups. 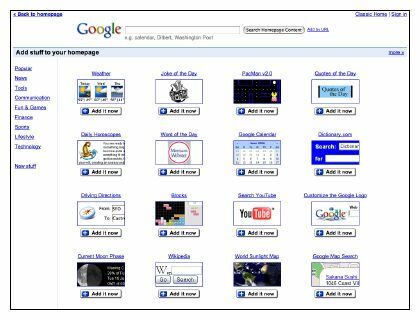 Take a look at Google's CogMap. Have a go and build your own. The very excellent sequel to Back to School with the Class of Web 2.0 has recently been published. Flickr photo annotation... I've not spent enough time looking at these tools and how they have developed. This page also describes What Can We Do With Flickr?. 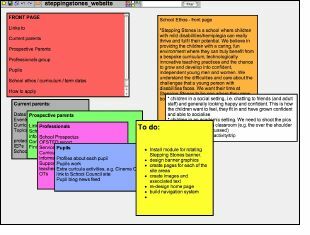 Using Wiki tools for making revision notes. Wikispaces, http://www.wikispaces.com/ seems to be a popular tool these days. the amount of video content readily accessible by YouTube, Google Video and VideoJug. Only YouTube doesn't offer an educational category for their media. 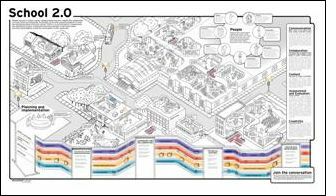 School 2.0 - looks really interesting and probably demands a separate discussion. Go and have a read for yourself... and don't forget to look at Part 1 and Part 2 if you haven't already done so. It's good. Just when you think things couldn't get better, I learn of this new promotion from Skype offering free calls to any landline phone in the UK. Handy, having just bought a Skype WiFI phone device. You still need to purchase SkypeOut credit in the usual way, which starts from 10 Euros, but you'll not be using any of them all the while you are making landline calls. 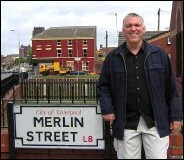 Merlin John, the founder and past editor of the very excellent TES Online magazine, now provides a new service to ICT enthusiasts and professionals through his website, Merlin John Online, http://www.merlinjohnonline.net/. 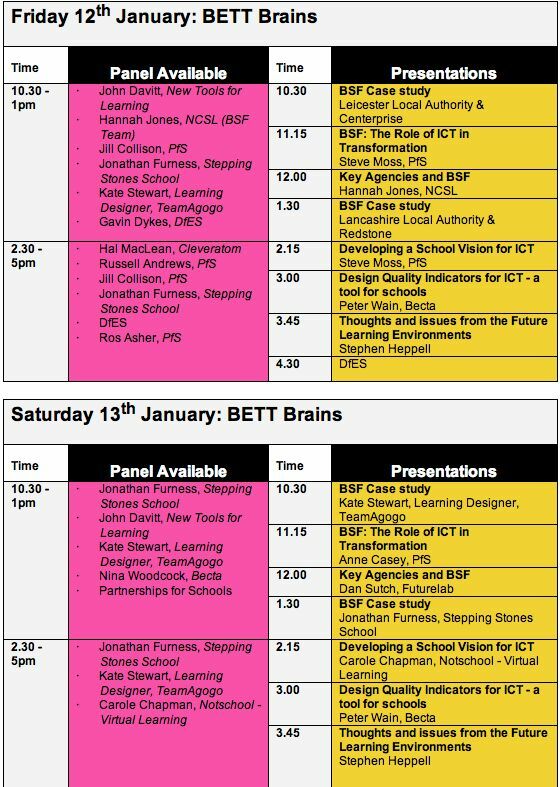 Read his site for current musings about ICT in education. I met Merlin, briefly, at the NASEN & TES Special Needs Exhibition in London today. Daniel and Jessica from Stepping Stones School attended the the Be Very Afraid III event on 2nd October 2006. 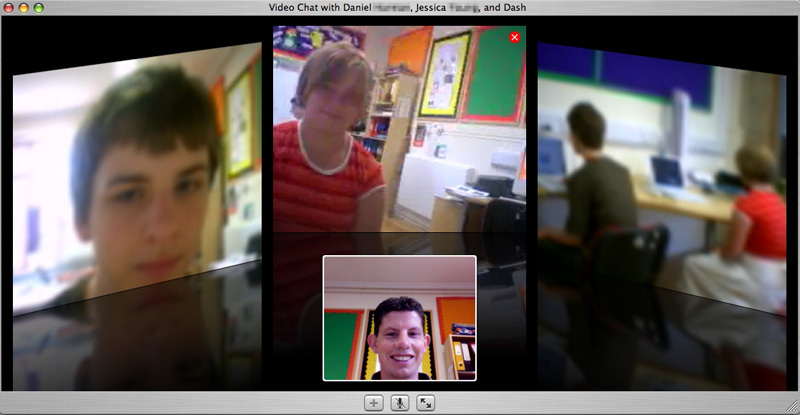 We used iChat AV to video conference with the pupils who weren't able to come. The event was held in London at BAFTA, Piccadilly. The day involved pupils from a variety of schools and colleges, showcasing their digital creativity work. The whole event was organised and managed by heppell.net, together with DfES and BAFTA. 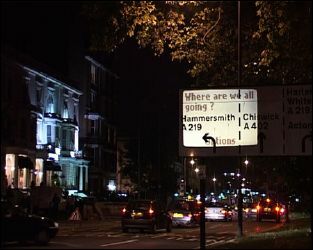 ... though not until December 2006. A Times Online article reported that SpiralFrog has licensed music from Universal Music Group (UMG) in exchange for displaying advertising whilst each track is downloaded to users computers. "SpiralFrog will offer users of its no-cost web-based service the ability to legally download music by many of the world's most popular and award-winning artists." Read the SpiralFrog Press Release and also sign up for email notification with more information about this new site. I was discussing the transfer of large video files with Dan earlier, and how limiting it is that the bandwidth between residential houses is so narrow. This is largely due to the technology used on the phone network at the BT exchanges, yet surely it doesn't have to be like this? In a world of increasing demands for faster, more reliable and cheaper broadband connections, surely the solution lies in converting phone networks to IP networks, where houses are connected with an IP address rather than a dial tone. We could still hook up our phones via the Voice Over IP technology, but means that the devices in those green BT boxes on our streets will be filled with switches and hubs to connect houses together. In an ideal world, fibre optic would replace existing copper, yet I can see the huge expense involved. Regardless of that, the copper that runs to each of our houses is capable of gigabit networking. So why don't we utilise the existing copper in exchange for faster connections? Perhaps cost and demand has something to do with this. 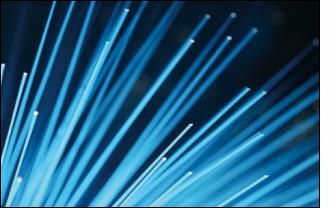 The average home owner would barely understand gigabit networking, let alone VOIP or even be aware of its significance. However, the take up of broadband in residential houses is enormous, that I wonder how soon more consumers will be demanding more speed. Watching TV and downloading films over the Internet will further increase demand for faster connections. Somehow, I think the chances of someone creating lots of wireless networks by placing Wi-Fi boxes on top of telegraph poles or street lighting might come sooner than BT upgrading its network infrastructure. As we near the start of WWDC, the anticipation heightens as we await the announcements from Steve Jobs about new products and developments from the team at Apple computer. What can we expect from Apple at this annual developers conference? a preview of the new operating system, Leopard and maybe a release date. a replacement system for the G5 Power Mac... sporting an Intel chip. Perhaps in a revised case. announcement about production of an Intel XServe system. a new consumer device, perhaps the iPhone, or revised iPod Video with wireless / bluetooth technology. some home entertainment / telephony (Voice over IP) enhancements for the whole range. Apple usually streams a recorded keynote presentation for people to watch after the event, so keep your eyes open on the Apple site. During the keynote, I usually read a text based transcript provided by the MacNN site. Just by chance, I stumbled across the multi-way video conferencing technology that exists in iChat. You might think, well, what's new? That's been possible for easily a year now, and I played quite a lot with that sometime ago whilst I was still working at Ultralab. However, back then, I had to use the G5 Power Mac Desktop computer to initiate a multi-way iChat conference using video, but now it seems the MacBook Pro laptop is powerful enough to host such a conference. 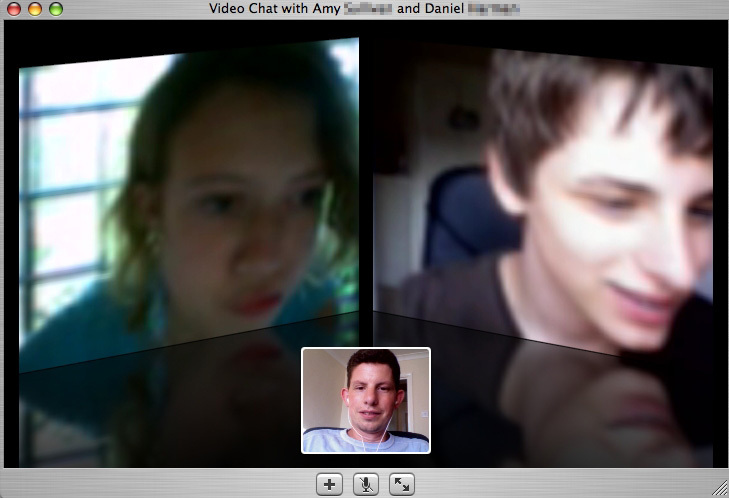 Amy, Dan and I played with this technology yesterday evening. Although the quality of the image was much reduced, the audio came through very clear and was perfectly useable. Both Dan and Amy's images of the other participants in the conference was not so clear as mine. I'm not sure whether this was due to the limited bandwidth they each had, or that their computers are the less powerful iBook machines, or whether in fact, being only participants rather than the host had anything to do with it? We tried to connect again on our local network at Stepping Stones school, this morning, and found the same issue about image quality applied. This perhaps rules out a bandwidth issue since we were each running on at least 10Mbits wireless connections. Read more about our explorations using iChat and multi-way video conferences. I'm not usually one for keyboard shortcuts, apart from the basic ones, like Undo, Select All, Copy / Paste etc. I subscribe to Apple's 'Hot Tip' feed which explains how to send your Mac to sleep in just two seconds. "Want the fastest way to put your Mac right into a deep, sleepy-bear hibernation-like sleep (no whirling fan, no dialogs, no sound â€” nuthinâ€™ â€” just fast, glorious sleep). Just press Command-Option and then hold the Eject button for about 2 seconds and Zzzzzzzzzzzzzz. It doesnâ€™t get much faster than that." This is a Firefox extension, developed by Google Labs. Google Browser Sync unifies your bookmarks, history, saved passwords, and persistent cookies across all the computers where you install it. It also remembers which tabs and windows you had open when you last closed any of your browsers and gives you a chance to reopen them. This is something that I've been looking for for years, yet not prepared to pay for the .Mac subscription which is an alternative. Orbicule have written some really neat software called Undercover and TheftSensor. Undercover is aimed at recovering your Mac in the event of it being stolen. It relies on screengrabs, built-in iSight camera shots and Internet IP addresses to determine the identity of the thief and allow the Police to track down the persons location. TheftSensor makes use of the motion sensor to determine whether the computer is being moved without authorisation. When the software is 'armed' the alarm will sound if the computer is moved or the computer lid is closed. This software works with any Mac that has a motion sensor, which includes the latest iBook revision and the entire MacBook and MacBook Pro range.